DOWNTOWN BROOKLYN (WABC) -- The circus is in town, for the final time. 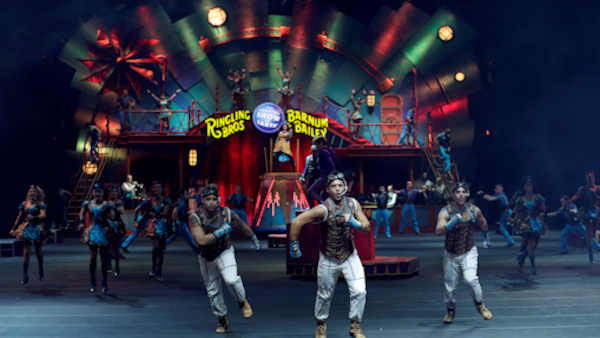 The Ringling Brothers and Barnum & Bailey Circus is on its final tour, and is making its last visit to New York City. It opened Thursday at the Barclays Center in Brooklyn, and will be there until March 3rd. But the circus will soon be folding its tent. Last month Ringling Brotehrs announced it will go out of business because of declining ticket sales. The final show, after 146 years, will be in May at the reopened Nassau Coliseum. The circus, with its exotic animals, flashy costumes and death-defying acrobats, has been a staple of entertainment in the United States since the mid-1800s. Phineas Taylor Barnum made a traveling spectacle of animals and human oddities popular, while the five Ringling brothers performed juggling acts and skits from their home base in Wisconsin. Eventually, they merged and the modern circus was born. The sprawling troupes traveled around America by train, wowing audiences with the sheer scale of entertainment and exotic animals. By midcentury, the circus was routine, wholesome family entertainment. But as the 20th century went on, kids became less and less enthralled. Movies, television, video games and the internet captured young minds. The circus didn't have savvy product merchandising tie-ins or Saturday morning cartoons to shore up its image. "The competitor in many ways is time," said Kenneth Feld, chairman and CEO of Feld Entertainment, adding that transporting the show by rail and other circus quirks - such as providing a traveling school for performers' children- are throwbacks to another era. "It's a different model that we can't see how it works in today's world to justify and maintain an affordable ticket price. So you've got all these things working against it." The Feld family bought the Ringling circus in 1967. The show was just under 3 hours then. Today, the show is 2 hours and 7 minutes, with the longest segment - a tiger act - clocking in at 12 minutes. In May of 2016, after a long and costly legal battle, the company removed the elephants from the shows and sent the animals to live on a conservation farm in Central Florida. The animals had been the symbol of the circus since Barnum brought an Asian elephant named Jumbo to America in 1882. In 2014, Feld Entertainment won $25.2 million in settlements from groups including the Humane Society of the United States, ending a 14-year fight over allegations that circus employees mistreated elephants. By the time the elephants were removed, public opinion had shifted somewhat. Los Angeles prohibited the use of bull-hooks by elephant trainers and handlers, as did Oakland, California. The city of Asheville, North Carolina nixed wild or exotic animals from performing in the municipally owned, 7,600-seat U.S. Cellular Center. Attendance has been dropping for 10 years, said Juliette Feld, but when the elephants left, there was a "dramatic drop" in ticket sales. Paradoxically, while many said they didn't want big animals to perform in circuses, many others refused to attend a circus without them. "We know now that one of the major reasons people came to Ringling Bros. was getting to see elephants," she said. "We stand by that decision. We know it was the right decision. This was what audiences wanted to see and it definitely played a major role."